(From Journal) 7:30 PM June 11th. Left Cache Creek at 7:15 this morning. Saw 4 bear and 3 deer. 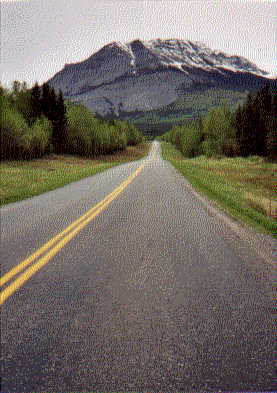 Maybe someday I'll come back to tour just Canada--there's so much wilderness here. Drove about 500 miles. 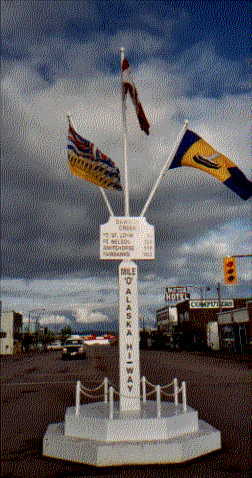 Made it to Dawson Creek, BC, Mile 0 of the Alaska Highway. I might have bitten off more than I can chew with this Alaskan trip. This wasn't in my travel plans, so I'm playing it by ear. It's a long, long way! I'm beginning to feel pressured by money and time limits. At this rate I don't think I'll make it home by July 1st. And financially--I'll be paying for this trip for 2 or 3 years...maybe more. But I'm this far, and not going back now. You only live once and chances are I'll never get to come this way again--so it's go for broke! Above: Ain't that a pretty sight! No Sweat! I can make it, and that goes double for my Kia! June 12 6AM: I''ve been going to bed pretty early lately, so I seem to be getting up around 4:30 AM for the last few days. I guess the time change makes a difference too. Plus, it's light when I go to sleep, and light when I get up. I'd like to stop in at the visitor center here in Dawson Creek, but it won't be opening for another 3 hours. And by then I could be maybe 100-150 miles down the road. Tents down. Car's packed. Peanut butter sandwich and water for breakfast. Time to go. 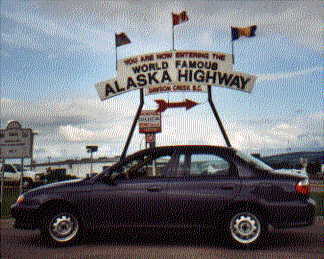 First day on the Alaska Highway! Only 1,523 miles to go to Fairbanks! 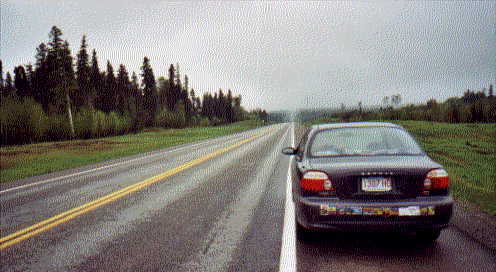 6 AM First day on the Alaska Highway! Just me and my "unstoppable machine!" 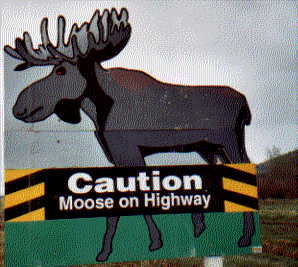 Quite a bit of construction on the Alaskan Highway. They are in the process of taking out the "many curves" in the highway. It's been taking years, and will take a lot more work to complete the job. 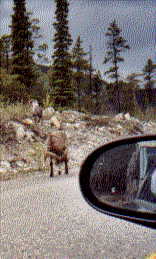 Above: And two moose crossing the road...They are a lot bigger in person--really! 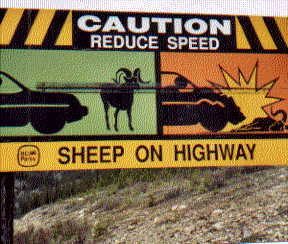 Above: Sheep on highway sign. 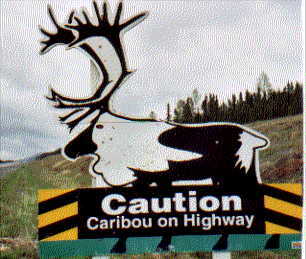 Above: Caribou on highway sign. 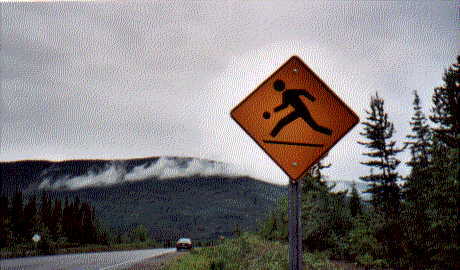 Above: Kid chasing a ball across the Alaska Highway sign. 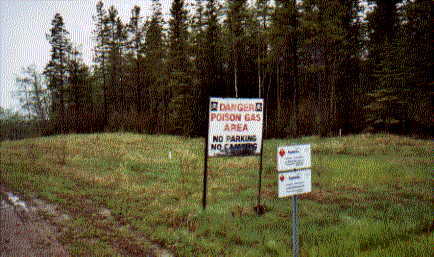 Nope, surely didn't see any kids chasing balls across the Alaska Hwy. This lake is the most beautiful milky, emerald color that you've ever seen! Not like the picture. Left: I wish I were a photographer so most of my pictures would come out so crappy. 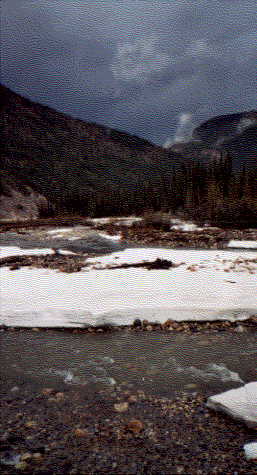 The scene on the left is an ice-filled river running through the mountains--although it hard to tell from the picture. Darn. I should practice more. Maybe read up on photography. I think I will. 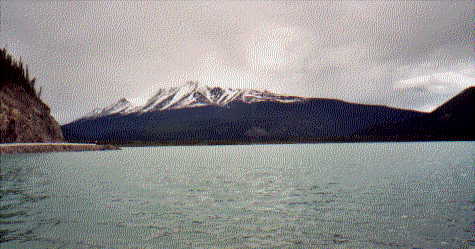 Below: These are an example of "Sawtooth" mountains--I read that on the plaque. And here's a book (actually a huge magazine updated every year) that I wished I had with me. 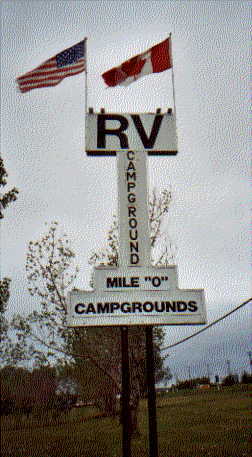 People I met on the road kept saying, "You should have THE MILEPOST. 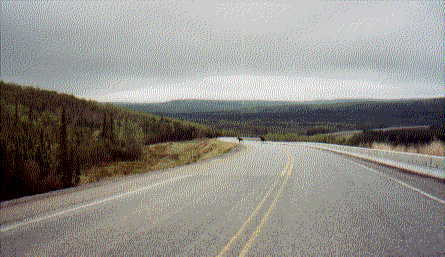 Anyone driving the Alaska Hwy. should have it." Well, they were right. But I had never heard of the book before. And I didn't end up buying it until AFTER I got home! This book explains EVERYTHING--distances, landmarks, attractions, places to stay, etc.. The book is kind of expensive, but it's worth it. Last years issue would be cheaper & it's probably just about the same as this years issue.